Lucky #8 - Sherrie - will you please get in touch with me? I love the classy simplicity of kraft paper. With a few rubber stamps and some embossing tools, I've been whipping up simple card sets for my friends for Christmas. I made some for you too my friend. I am giving away a set of eight cards and envelopes. 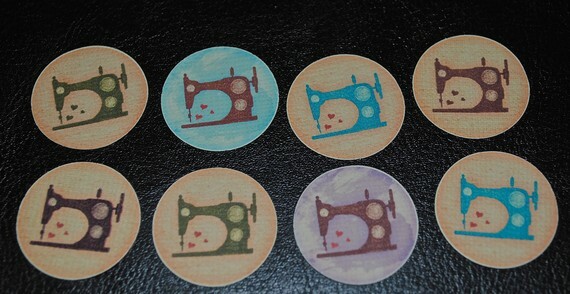 Found these sewing machine envelope seals on Etsy and thought you'd want some too. One little package is yours for the taking. Simply leave a comment below to be entered in the giveaway. Giveaway open to anyone anywhere (followers feel free to enter twice. I like to see you regular readers get lucky). Please make sure you leave your email address if you are a No-Reply-at-Blogger.com person. I will draw a random winner on November 14th. so darling! love brown kraft paper. . . Very cute. I love wrapping presents in kraft paper too and then dressing them up. I LOVE the embossed ones! I am googling that machine right now! And, I follow you! Thanks for the opportunity! Those are so pretty! Would love to have some to use myself! Oh, how lovely! I'd be thrilled to have them, and to give the seals to a seamstress friend of mine. oh they do look pretty cynthia...but i know the post to malta is not cheap (and i am still drooling over my other package ;)). but you also give me inspiration, so thanks. These cards are so classy! love them and terrific and timely giveaway! Beautiful. Simple really does make a statement. Thanks for the inspiration! Hi! I am, of course, entering your giveaway. Additionally, I would like to send you an email, but am unable to send it b/c it says the address is incorrect...would you mind dropping me a line at trickridinggirl at yahoo.com. Thanks! So much fun, those are adorable! Those cards are really cute! Nice job! *waves* Me! Me! And I'm going to see if I can find those cards at Walmart. They look really good! I've been wanting to do some not-overly-christmas-y christmas cards. These are lovely! These are simple & lovely cards. I'd love to win these.